Thursday Thoughts: New and Improved, Just for You! Hey students! The writing center has a BIG announcement, and we are very excited to finally be sharing the news with you. Since the beginning of 2016, we have been working hard to better our APA style modules for you, and the day has finally come! A big thanks goes out to our staff who have championed this cause. Beth Nastachowski, Rachel Willard, Melissa Sharpe, and Hillary Wentworth, THANK YOU. 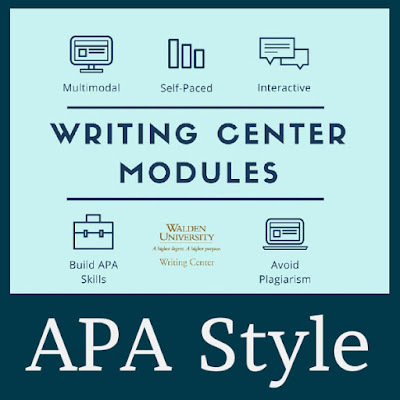 Alongside our grammar modules and plagiarism prevention modules, these new and improved APA style modules are another essential tool for your success at Walden. They allow you the opportunity to learn at your own pace about the aspects of APA that you need to better understand.The new APA style modules will be your key to understanding some of the trickier aspects of APA, such as avoiding bias and clarifying the actor. They will also help you to understand tricky formatting guidelines for numbers, headings, and lists. 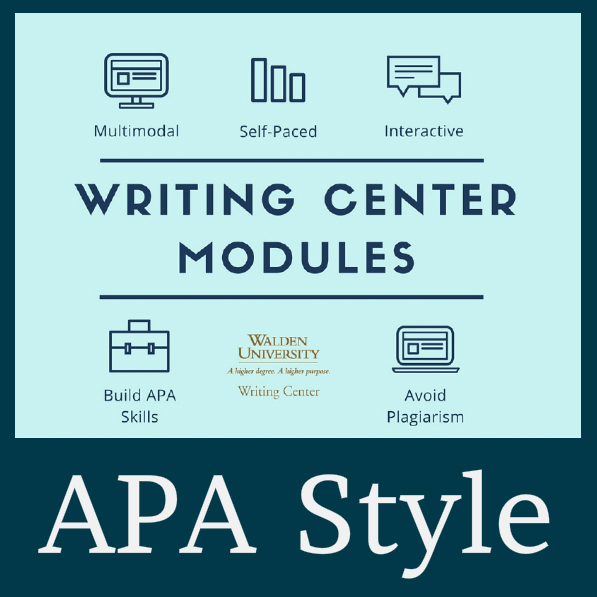 If you've pulled up our page for the new APA style modules, and you are not sure which modules will be the most helpful for you, consider taking one of our diagnostic quizzes for some guidance. These diagnostic quizzes will point you in the direction of the module(s) that will be most beneficial for you to study. The References and Citations Quiz would be a great place to start! Finally, the biggest thanks goes to you, our students, for being an inspiration to us to always better our services and strive to be the best. This improvement is for YOU! The Walden Writing Center offers to Walden students 1:1 writing support and offers to students and non-students alike all the writing expertise, tips, and information a writer could want.